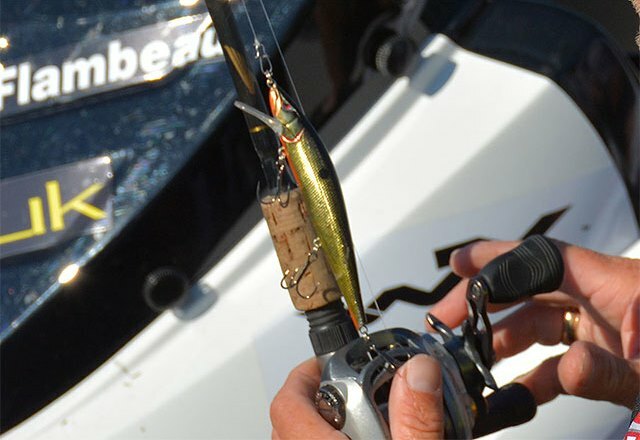 Coming into the 2016 Bassmaster Classic, the thought among many fishing pundits was that the jerkbait would be a key player on Oklahoma's Grand Lake o' the Cherokees, a lake that is typically chilly and relatively clear at this time of the year. But that was before the onslaught of this winter season's El Nino affected weather across northeastern Oklahoma. That meteorological phenomenon has brought enough wintertime rain to cloud Grand Lake's waters, not to mention enough warmth to leave water temps a bit ahead of schedule for so early in March. So as Classic Week 2016 gets underway, one question being posed is this: Will the jerkbait still be much of a player in who ultimately wins the Bassmaster Classic? Maybe. And maybe not, says Major League Fishing and Bassmaster Elite Series pro Mike McClelland, an angler who lives only an hour away in northwestern Arkansas. While Grand Lake isn't actually his home water, McClelland does have a fair amount of knowledge and success on the 46,500-acre water body lying on the Grand River system. So when he talks Grand Lake fishing strategy, it pays to listen. Especially on the eve of the 2016 Classic fishing derby. "It got cold enough a couple of weeks ago that it cooled the water down a bit," said McClelland, a veteran pro who won the 2006 Bassmaster Elite Series event held on Grand. "The biggest factor with this El Nino going on is the fact that we've had a week or two with temperatures in the 50s (here recently). "But the lake color is going to dictate things more than anything." Dictate things in terms of just how important that jerkbait bite eventually proves to be, that is. "I still believe that a jerkbait will play a major role in the (outcome) of the Classic, if the lower end of the lake has decent enough water clarity for guys to throw a jerkbait with confidence and effectiveness," said McClelland, a 48-year-old angler from nearby Bella Vista, Ark. McClelland, who used a jerkbait to earn a Championship Day finalist spot at the very first Major League Fishing event ever contested on Texas' Lake Amistad a few years back, was quick to point out that visibility is always a key with this lure. On Grand Lake or any other water body, for that matter. "A lot of people think that a jerkbait is only a good bait when you have three, four or five feet of visibility," said McClelland. "And in all honesty, most of the time on Grand, even when they bite a jerkbait, you don't have that much visibility." "So it can definitely still be a player (this week)." Even with water conditions being a bit more stained than usual. While McClelland missed qualifying for this year's Classic, he will be a busy man giving seminars and conducting personal appearances for his sponsors at the Cox Business Center as the Classic Outdoor Expo takes place in downtown Tulsa. And he'll be keenly interested in what is going on out of the waters of Grand Lake, especially in terms of who is leading and who isn't and how it is all going down. All the while wishing that he was out there throwing his signature series Spro McStick jerkbait, a bait that helped secure McClelland a fifth place finish at the 2013 Classic held on Grand Lake. "It could still definitely be a player (this week)," said the seven-time winner on the B.A.S.S. tournament trail, a total that includes a 2015 Elite Series triumph on nearby Table Rock Lake. But with Oklahoma water temperatures warming up nicely, what would normally be a tournament where prespawn fish in staging areas figured prominently in the eventual outcome could be more of an event where anglers actually win or lose by going shallow and beating the bank. "I think the fact that it is dirtier, particularly on the upper end, and the fact that it is warming up so dramatically right here before the Classic takes place, that there are going to be a lot more guys that run the banks catching fish on crankbaits and jigs and spinnerbaits and rattling baits and things like that," said McClelland. Will that be the case even with the National Weather Service predicting a couple of dry cool front passages during Classic week that will bring morning lows down into the lower and mid 30s on at least a couple of occasions? After the recent run of mild and sunny late winter weather on Grand, McClelland says yes. "The fish are definitely going to get active (over the next few days)," he predicted as the March 4-6 Classic prepares to get underway. "Because the water temperature has jumped dramatically (over) the last few days. Because of that, a couple of chilly mornings could actually help the jerkbait bite. "The fish are going to get active (soon)," said McClelland. "But if we get in a little cool snap, the thing that will make a difference is the guy who is willing to slow down and throw a jerkbait. "He'll probably still be pretty likely to catch a few fish on the jerkbait, depending on the water clarity." With Ozark regional lakes being more stained than normal – for this time of the year, that is – what kind of water clarity is the veteran bass angling pro talking about? "As long as the water clarity has a foot, a foot and a half of visibility, I'm going to say that the jerkbait is going to play (a role)," said McClelland. With meteorologists generally predicting bright, sunny skies and a little bit of wind this week (wind speeds are predicted to be in the 5 to 10 mph range), the slight chop on the water's surface could also help out a jerkbait bite in McClelland's mind. "I honestly think that as long as there is wind and sunshine, that is going to make the jerkbait bite just that much better, especially in the dingy water situation," he said. The bottom line is that the 2016 Classic should be a vastly different event than the 2013 version was. There's no early week snowstorm depositing several inches of fluff on competitor's boats, there isn't any ice building up in the back of protected coves and water temperatures and air temperatures will be much milder than they were three years ago. All of which means that the jerkbait could be a key player in this week's Classic outcome. "I think any year that you're fishing a Classic in an environment where the water temperatures are going to be in the upper 40s or 50s, a jerkbait is going to cross any good angler's mind," said McClelland. "All it takes is a few bites and a little bit of confidence to get that deal going." And that's getting a deal going well enough to – if you'll pardon the pun – McStick a few fish with a jerkbait's treble hooks, boating a hefty three-day total. A final tally that will enable this year's winning pro to walk across the stage at the BOK Center in downtown Tulsa as the Classic champ and this year's king of professional bass fishing.